Basements may not be the first place you would think about installing stained glass windows, but I recently had a client who faced a not-so-uncommon dilemma. Windows in basements are an imperative part of the space. They allow for natural light to fill the room; otherwise there would be none. However, they also allow for an unattractive view, typically looking directly at a metal sheet, rocks, and eventually a collection of spider webs. Some people resort to curtains, which defeats the purpose of these windows. My clients, on the other hand, thought outside of the box. 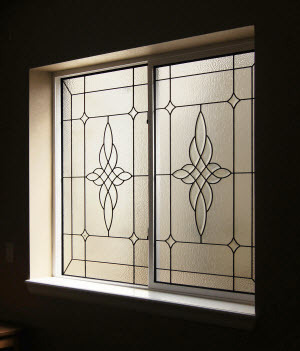 They decided to install leaded glass on their basement well windows. One of the most important parts about the design process for basement stained glass windows was choosing the colors and textures. We needed to use glass that would eliminate the view while not blocking or reducing too much of the natural light. Clear or Colored Stained Glass? This immediately eliminated the option of colored glass, as they thought that would deduct from the light provided. That left us with leaded glass to choose from. The texture we chose also had to create a high level of distortion, as the rocks and metal wall in the window well were in close proximity and a glass with a low level would still allow you to see what was there. The final glass choices in the basement leaded glass windows was a hammered glass alongside bevels and vecchio. By utilizing stained glass, they were able to eliminate the undesirable view while maintaining the element of natural light. They also got to add a custom piece of art glass and a focal point to the basement entertainment room, creating a more beautiful space for themselves and guests to enjoy. If you’re interested in enhancing the style of your basement windows, contact Scottish Stained Glass for a free consultation today!